As the day of the Royal Wedding between Prince William and Kate Middleton draws near, Te Papa too has found itself in the grip of ‘wedding fever’. While the media continues to whip themselves into a frenzy trying to uncover the bride’s best kept secret – the name of her dress designer – we are in raptures over the list of designers featured in an exhibition curated by the Victoria and Albert Museum, London, which opens at Te Papa in December 2011. 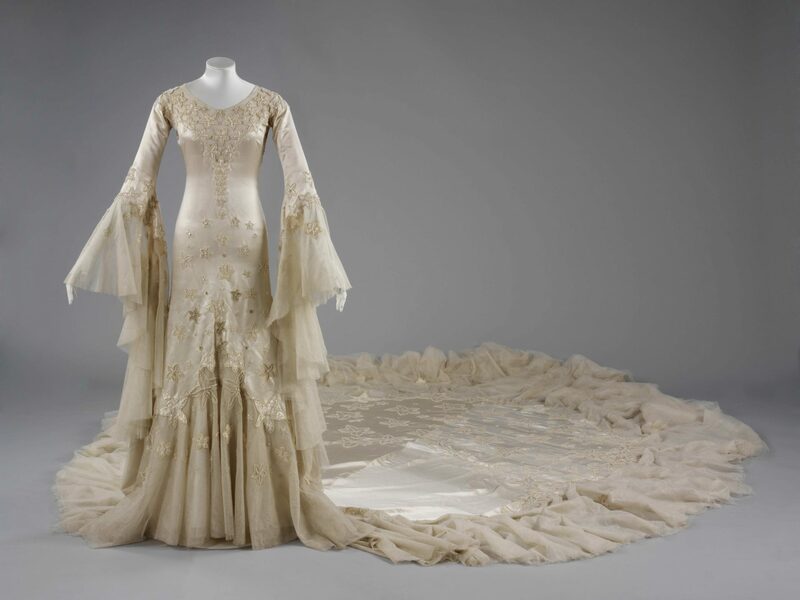 Romantic, opluant and extravagant, the exhibition encompasses 200 years of wedding dress. While Alexander McQueen – the design house most rumoured to be creator of Kate Middleton’s dress – is not represented in the exhibition, several designers synonymous with Royal occasions most certainly are. At the top of the list is Normal Hartnell who designed Princess Elizabeth’s (Prince William’s grandmother) wedding gown in 1947, for her marriage to Lieutenant Philip Mountbatten. In 1947 the press didn’t really need to guess who was going to make Princess Elizabeth’s gown. Hartnell was the obvious choice. He had been successfully dressing her mother, Queen Elizabeth, later the Queen Mother, since 1938, and understood what such an occasion demanded. A master of spectacle, Hartnell designed a satin gown for Princess Elizabeth adorned with 10,000 pearls. The train, which was 15 feet in length, was woven in Essex and featured an intricate pattern of stars. In 1953 he created an even more spectacular gown for her coronation, which kept six embroiderers engaged for months. The V&A exhibition features two gowns by Hartnell – including this extraordinary dress, (pictured below), designed for Margaret Whigham, the daughter of a Scottish millioniare who married American golfer Charles Sweeny in 1933 (she later became the Duchess of Argell on her second marriage). Such was the publicity surrounding her dress (as well as her beauty), that the traffic in Knightsbridge was blocked for three hours as 3000 onlookers flocked to Brompton Oratory. With its spectacular train, we expect it to stop traffic within the exhibition as well. The gown shimmers with stars, as did Princess Elizabeth’s brides maids dresses, also by Hartnell. David and Elizabeth Emmanuel, the creators of Lady Diana Spencer’s voluminous ‘Cinderella’ gown of 1981 are also represented in the exhibition, although not by one of their own extravagant creations. The exhibition features Elizabeth Emmanuel’s own wedding dress from 1976. Her designer of choice? The flamboyant Zandra Rhodes. Philip Treacy, the milliner whose extraordinary exhibition When Philip Met Isabella captivated thousands of visitors to the Dowse Art Museum in 2007, also features in the exhibition (as well as appearing on this week’s episode of Project Runway!) Historically, hats and royalty go hand-and-hand. As Treacy says ‘I make hats for royalty from all over the world because they wear hats’, and on the subject of hats and Royal weddings, ‘They’re exciting hats to make, because hats and royal weddings are both about magic, happiness and a sense of celebration.” In April 2005 he added the final touch of magic to Camilla Parker-Bowles’ elegant wedding outfit by Robinson Valentine. As Treacy also comments, hats are not just for Royalty. Everyone has a head, so anyone can wear a hat. Anyone can also wear a great wedding or civil union ensemble, and we would love to see YOURS. We’d like to invite you to dig out your wonderful family photographs of weddings and more recently, civil unions and upload them to our wedding photo database. We’ve already uploaded a selection of images from our photography collection to get the ball rolling. Our aim is to provide a rich record of how our society and fashions have changed, revealing patterns of migration, and what is unique to New Zealand. We hope that rather than over-dosing on wedding fever, that you get in the swing of it and let it carry you away! We’d love to rival the V&A’s already rich database. I just hope Kate, will wear a lovely dress with not too many frills, she doesnt seem the person for that style, I would like to see her in a simple dress, with some Honiton Lace on the bodice coming down like a tunic with a plain skirt, and nice train.. long sleeves, lace… with her hair done up in a lovely style… no doubt will have a tiara to wear.